Report on a lunchtime talk, given as part of Mental Health Awareness Week, on 13th May 2016 by Jenny Williams. business matters is grateful to Lindsays for hosting this lunchtime seminar and providing tea and coffee for those attending. Jenny started by asking those present what had brought them to the talk. She used the answers to guide her in how she approached her presentation. Words like “anxiety” and “stress” were used in reply and it was clear that people would value the ability to be calm and considered in response to situations that they find themselves in and to be able to cultivate the ability to stop and “listen to ourselves”. Jenny is trained in biology and started by explaining in simple terms how our brain operates and how our thoughts and emotions are linked and affected by the biochemistry of the brain. A diagram to help explain this is accessible at the foot of this article. These biochemical processes, working across the limbic system, the pre-frontal cortex and the adrenal system, happen very quickly and give rise to our typical responses to any situation of fear/flight/fight. They are much faster than our conscious thought processes and so often allow instinct to overrule rational thought. If we want to avoid this and to have a more considered response to a situation it can help to consciously be aware of our heartbeat and breathing – doing this may provide a focus which allows our bodies “time to think”. Jenny moved on to discuss the fact that our brains have two sides and that our thought processes and reactions are never black or white but are a combination of logical and imaginative elements. As we interact with others we are sometimes conditioned by historical experiences and the relative dominance of the two approaches can vary. Sometimes it can feel as though a number of voices are speaking to us, almost as if “around a table”. 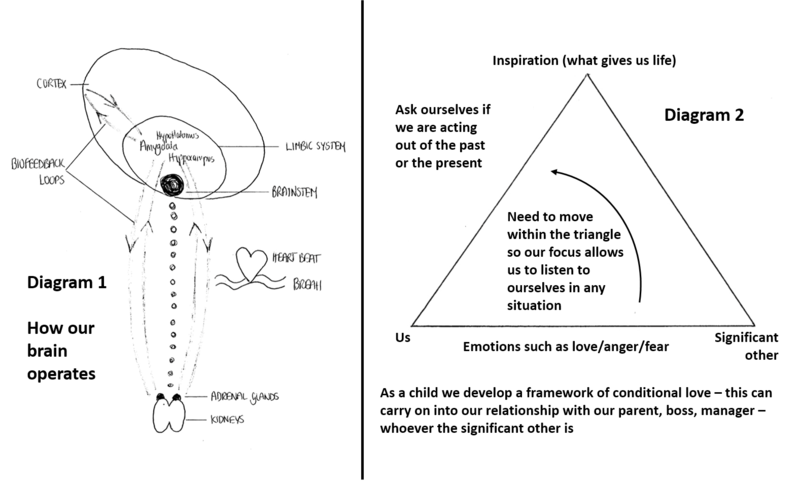 Recognising our position in, and response to, these situations can be thought of as being inside a triangle and seeking to move to a point where we work appropriately to our current circumstances and draw maximum energy from our understanding of the processes involved. This is shown diagrammatically in the image, accessible from the foot of the page. Having explained the background, Jenny encouraged and facilitated a time of discussion around the three “C’s” mentioned above and the comments at the end of the meeting showed that those attending had found the session to be constructive and helpful.